Command-J duplicates the entire current layer, or a portion of the current layer, if there’s a selection. It’s a great feature, and one I use daily. For some strange reason, Command-J doesn’t do anything when there’s two layers or a layer group selected. Why? I realise there’s probably a decent technical reason for this, but a context sensitive “just dupe it” command would be really handy, even if it’s actually several different methods behind the scenes. Is now a good time to mention that the Layer menu already contains an item that does most of these things, but it doesn’t have a keyboard shortcut by default? Pre-emptive strike: Assigning a keyboard shortcut wouldn’t help, as the menu item doesn’t duplicate selections within a layer (Command-J does). Marc, great idea. Thanks for the suggestion. I'll try to put something together. Right now I have it set up as command-J for dupe layer and dupe selection, plus command-shift-J for dupe layers and dupe group(s). So there's already a good workaround. Just seems like it could be even better, allowing for faster workflows and less keyboard shortcuts. Less shortcuts for more ability. Ah.... I misunderstood. I thought you wanted to be able to dupe a selected potion from multiple layers... i.e. Command-J with a selection for multiple layers at once. You were just asking to combine 2 shortcuts/commands into one a single command. That definitely makes sense. We have Copy Merged for doing that (which I use regularly!). This wouldn't merge them. I don't know how helpful that would be, though. it would make sense to me that command-j would also dupe groups like it does layers. please add. Put this script into photoshop/presets/scripts and assign it to cmd-J. It should do exactly what you've requested. David - that is great. thank you. Just wondering - can you script adjustment layers so that they always open in the CS3-style modal dialogues? I'm sure it can be done somehow. You can assign this script to a keyboard shortcut to modify any* adjustment layer with a modal dialog. (*it doesn't work with gradient maps, though.. not sure why). You can't override the double-click behavior with a script. A panel could be made to make new adjustment layers and automatically open their editor. Thanks again David that helps. But I'd love a preference in the next version of PS to have the modal windows replace the panel. I'm still trying to find ways to fully recreate modal dialogues like CS3. I feel that the adjustment panel is a big step backwards and it really slows me down. So many aspects of the panel bother me - I guess I'll start a proper feature request on this site. if you have any other adjustment layer scripts i would definetly check them out. The script could do with a header. I wrote one but cannot post it here (see image). Grrr! Still cannot do it. agreed. seems dumb simple to me. Thats an interesting script, but honestly why do we have to do this manually when it should be a feature? The point of this site is for folks to make feature requests for improvements directly to Photoshop - and this idea is a good one that's under consideration. A side benefit is that cool users like David Jensen and Shangara are posting helpful scripts to help improve users workflows in the meantime. It seems like a perfect demonstration of why scripting ability and direct feedback to the Photoshop team is a great combination. It lets fringe features be built and tested. "Should be a feature" only exists after someone—either from the public or at Adobe—has suggested it. I've been pushing for this feature for almost a year now and am very excited that maybe some day soon it'll be part of Photoshop and therefore accelerate my workflow. David's script is fantastic. Thanks David. Great script, David! I've been looking for a temporary solution to this. you can option - drag right on the layers palette, up or down. This will duplicate multiple layers very easily. No script needed. Adobe is vaguely aware of this. 1. Open folder where PS is installed. 3. Place the ScriptListener plugin into your root plugins directory. 6. You can copy and paste the chucks of code into a seperate script to run the given function. 2. Paste the code into a new file. You now have a stand alone script. This has got to be a cruel Adobe joke! I just assumed, like millions of other users, the plug-in is for script writers who want to debug their scripts. Why isn't there an interface to turn the ScriptListner on and off and given a name that would attract non-scripting people to try it, or a Scripts panel on par with Actions? Is this a joke on your part? 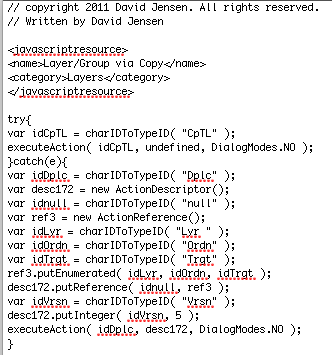 Adobe provides ExtendScript Toolkit to edit and test Scripts, a Scripts Panel in Photoshop seems utterly unnecessary. Scripting is a slightly more complicated technique than using Actions (ease of use being one of the advantages of Actions) – if you want to give Scripting a try Photoshop ships with the documentation, just check out the Folder »Scripting« beside the application. I don't want to give scripting a try. That's the point of the post (YMMV). I would rather not try scripting either...but if I do try, is there a way to STOP duplicating ONLY locked layers or groups - but not selections/unlocked layers/groups with the (command-)option-drag keyboard shortcut?? I can't envision how that could possibly work. I think PSD people should listen and listen carefully to what is being said here and in many other topic discussions. And I think they do. After all, we are the people buying their product - their future is in our hands. We provide invaluable feedback through this forum. Simply put, without us - their product would not be in stores and without our feedback it would not be as good as it is today, as I believe most 'bugs' are caught right here. A simple functionality such as allowing a layer set to be duplicated by pressing command J should be one of PSD's basic features - no question, and I trust the next releases will have it included. While we all appreciate input from all those out there finding pleasure writing customs scripts, most of PSD users rely on it's basic functionality. PSD, despite it's monopoly, proven worth the money and our trust over many years. I continue to believe that Adobe is taking our feedback seriously, because the day they stop, it'll to be the day they loose the right to call Photoshop the most intuitive, user friendly and complete image editing program in the World. As I said above, the point of this site is for folks to make feature requests for improvements directly to the Photoshop team - and this idea is a good one that's under consideration. A side benefit is that cool users like David Jensen and Shangara are posting helpful scripts to help improve users workflows in the meantime. The other aspect is, we can't implement everyone's pet feature request. Some changes that are requested are so esoteric that scripting really is the best answer to some users custom workflows. to who ever is complaining about scripts - this one and others from David work so well that it solves many issues for me. The other ones involve modal adjustment layers. scripting is really powerful, while i haven't put the time aside to learn to make them for myself, i've used ones made already and they make a tremendous difference in my workflow. not every feature request will get addressed by adobe (b/c many are not useful to many users) so scripting can fill in the pieces quite well. The scripting is not an issue, but not every one CAN or WANTS to script- especially something as basic as this. Programmers script. Artists do not. I agree the script is a solution that works. The issue is that Photoshop already has the duplication functionality that works with layers, and it should automatically work with anything within the layers panel. Hardly a pet feature. Scripting something like this is really just a band-aid for functionality that isn't a complete thought. I guess this is a common result of working ON the program- not in the program. "Photoshop the most intuitive, user friendly and complete image editing program in the World" - not sure where that came from, but this is NOT entirely accurate. Then please do tell, which program is? Certain programmers don't feel like learning how to paint either because they are busy thinking they are smarter than everyone else...one can maintain their tools just fine without scripting. There is NO one program that is the best at anything or does everything perfectly. Some functions are intuitive, but there are many features that are completely unintuitive. Photoshop has a Legacy of being the first, but like many other software packages is getting bloated with useless features and not refining its current workflows. It's like saying Microsoft Word is the best word processing software. While it is certainly possible for other programs to be the equal or superior in any one or all aspects it would seem to me that that does not at all rule out the possibility for relative superiority at all. Comparison can be used to arrive at a ranking of the objects of said comparison, so your statement seems peculiar. I guess I’m just being cantankerous, so please ignore the last post. ^ that's the extent of the code I wrote. The rest I just copied from a Photoshop plugin that spits out a chunk of code every time something.is done in Photoshop. That doesn't make me a programmer any more than painting a few brush strokes makes me an artist. Scripting is just another tool, and it can be used by an artist. I'm sure there are some who think artists shouldn't use a computer at all. DaveP - out of curiosity - would you name one professional image editing program that is in the same league with Photoshop today? No challenge intended here - just wondering. i agree with you. command-j should dupe a layer. it always annoyed me that it didn't. but for awhile, maybe 6 months ago i loaded a script, assigned command-j to it and now it dupes a layer or a group. so i dont think about it anymore. i didn't have to make the script but i can enjoy the workflow productivity it brings. there are bigger issues to me that i'd like addressed - so if his can be solved by a workaround that ends up being the same key command as the ideal behavior - i'm ready to let it be. This has been asked for many times. The fact that Command J on a Layer Group does nothing is not consistent. There is also no practical or technical reason why this couldn't be implemented as art of the app. Why was this left out? The command J shortcut was available from the very early versions of Photoshop to duplicate layers, it's not a recent addition. Layer "Sets" (layer called Groups) were introduced first of all I believe in Photoshop version 6. At this point it probably didn't occur to anyone to extend this functionality to Groups. And it's never been added. Just an oversight as far as I can see. Very good idea and solution. But i have a problem, I added it its directory but it doesn't appear in File > Scripts menu. And it didn't show up after restart? unfortunately. i also tried restart again after your comment but it didn't make any sense. did you save it as a ".jsx" ? Has this been officially announced? no no, sorry, i just saw the under consideration and the work around. This is implemented in Photoshop CS6. 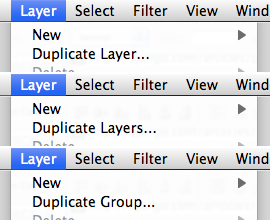 Cmd/Ctrl + J duplicates multiple selected layers as well as layer groups.